Honestly, I’m not ordinarily a big fan of Bridge. It’s much slower and less efficient for editing images and adding metadata than Camera Bits Photo Mechanic and lacks the asset management capabilities of an image cataloging system like Adobe Lightroom or Microsoft Expression Media. If you work exclusively in Photoshop, you’ll find Mini Bridge useful for managing the assets within a composite, layout comp or multi-photo image (like panoramas or HDR). It eliminates much of the jumping back and forth between Bridge and Photoshop, making it a welcome addition to the crowded suite of panels found within Photoshop. Particularly nice is the ability to run the Batch command from within Mini Bridge. 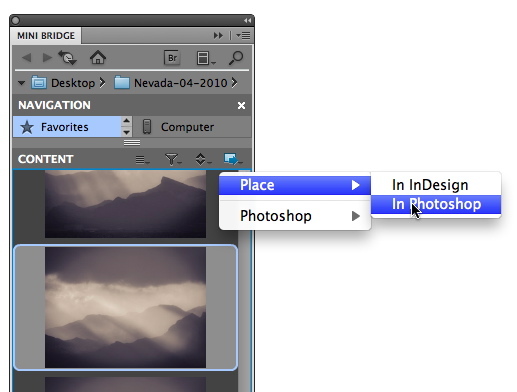 This allows you to quickly apply a Photoshop action to a group of images. This is useful for streamlining repetitive segments of your workflow like preparing images for online copyright registration or batch converting JPEGs for client delivery.